Includes: bra, belt+skirt, arm bands, necklace, headband, half-circle chiffon veil. Fabric: ivory orange tulips print chiffon and maroon chiffon. Beading: orange, maroon, net crystal stones . Bra: B/small C cup. 33" from end to end under bust. Belt+Skirt: one piece belt, 36" from end to end. 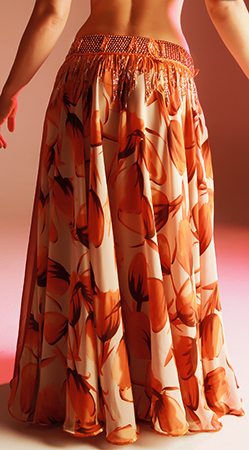 Chiffon skirt with slit on one hip and opening on the other is attached to the belt. Length 40" (incl. belt).